In line with their continued efforts to improve services and implement quality management practices to the highest International standards, A. A. Bin Hindi B.S.C (C) Central Warehouse department in coordination with the quality control department has recently compiled the formal Warehousing & Logistics policies and procedures for the group Warehouse department which extends its services to the various companies under the A. A. Bin Hindi Group. The new policies and procedures will ensure that best Warehouse practices are followed for the division’s activities. Bin Hindi Group Warehouse has the capacity of modern Warehousing management for their product and services in Bahrain for reputed brands like Kia Vehicles, Kia Genuine Spare parts, Renault Vehicles / Spare parts, Samsung Mobile Phone / Accessories, Samsung TVs, Printers & cartridges. Apple mobile phones & Accessories, JK Tyre, Sumitomo tyre, Federal Tyre, BKT tires and other major Chinese tires etc. ENOC, Cofran Lubricants & Sirio tyre alignment Machineries. Batteries like Free Max and Hugel … Etc. The new Procurement Policies presented to Mr. Ahmed Bin Hindi, A. 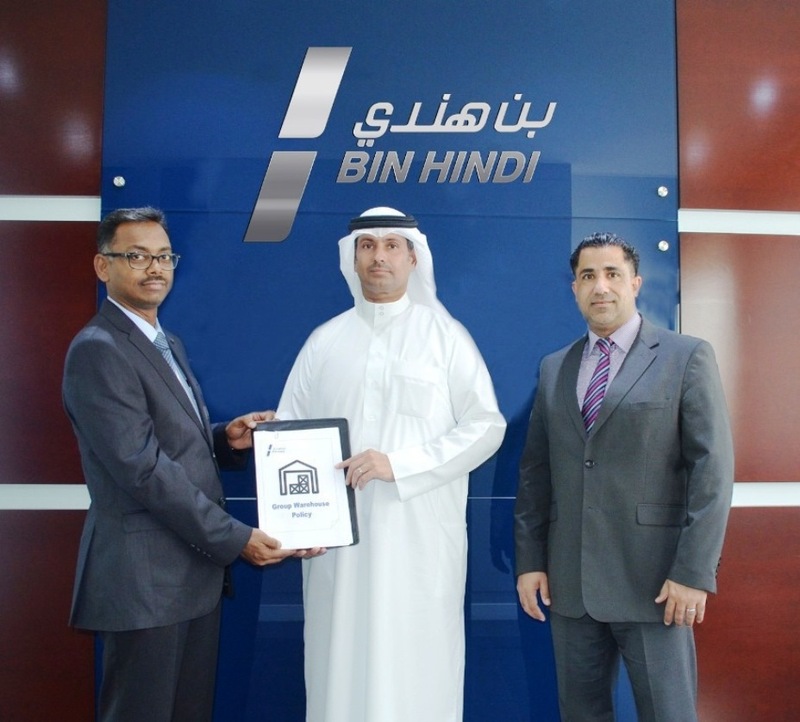 A. Bin Hindi Group Vice-Chairman & CEO by Mr. Selvarajan Subramanian, Chief Warehouse Officer. From the left; Mr. Selvarajan Subramanian, Mr. Ahmed Bin Hindi and Mr. Jassim Merza, A. A. Bin Hindi Group Chief Quality, Health, Safety & Security Officer.